Orthodontics is the art of using appliances to straighten and align teeth. Most commonly it involves the use of braces to move teeth into proper positing. In this method, brackets are bonded to the teeth and arch wires are threaded through the brackets. The arch wires act as a track, guiding each tooth to its proper position. There are several types of orthodontic braces available to patients, including traditional metal braces, ceramic “tooth colored” braces, as well as clear plastic braces. Damon Bracket – The Damon bracket uses a “sliding-door” technology called “self-litigation.” This new technology allows a wire to slide back and forth inside the bracket. This method requires no elastics, creates less friction and is therefore more comfortable for the patient than traditional braces. Damon brackets require fewer adjustments and a shorter treatment period. Ceramic “Tooth Colored” Brackets – Ceramic braces are translucent brackets that blend in with your natural tooth color. They are used with patients who are concerned about the appearance of their smile as they are less metallic looking than traditional braces. Ceramic braces are designed to resist staining and discoloration over long periods of time. Clear Braces – Clear Braces utilize brackets made of monocrystalline sapphire, which make the braces nearly see-through except for the thin arch wire. Next to the Invisalign system (below), clear braces are the closest thing to invisible braces. Metal Braces – Metal Braces are the most economical and traditionally used braces. 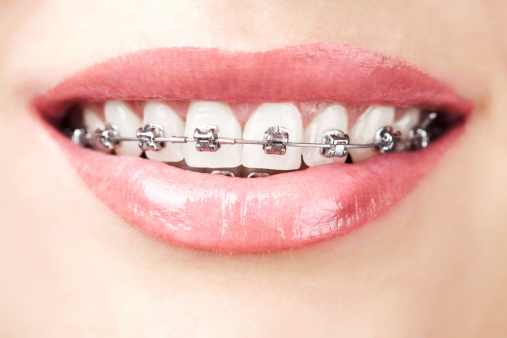 Metal braces are also ideal for those with more extensive realignment needed. Orthodontic Retainers are appliances made from plastic and stainless steel to custom fit your mouth. They act as a guide to hold your teeth into place after braces are removed. The retainer holds your teeth in place so your surround gums and bone can adjust around them – allowing you to maintain your realigned smile. Although the time you must wear a retainer will vary, many orthodontists recommend retainers are worn into the early 20s until the bone in your jaw and mouth has stopped growing.